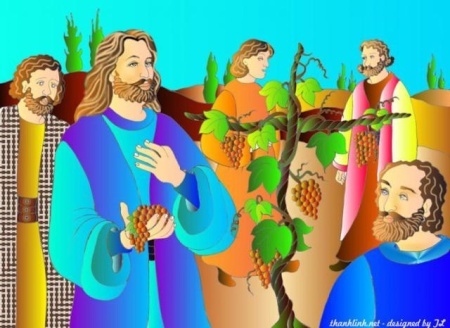 Gospel text (Jn 15,1-8): Jesus said to his disciples, "I am the true vine and my Father is the winegrower. If any of my branches doesn't bear fruit, he breaks it off; and he prunes every branch that does bear fruit, that it may bear even more fruit. You are already made clean by the word I have spoken to you; live in me as I live in you. The branch cannot bear fruit by itself but has to remain part of the vine; so neither can you if you don't remain in me. I am the vine and you are the branches. As long as you remain in me and I in you, you bear much fruit; but apart from me you can do nothing. Whoever does not remain in me is thrown away as they do with branches and they wither. Then they are gathered and thrown into the fire and burned. If you remain in me and my words in you, you may ask whatever you want and it will be given to you. My Father is glorified when you bear much fruit: it is then that you become my disciples". "Live in me as I live in you"
Today, once more, we may see Jesus surrounded by the Apostles in an atmosphere of especial intimacy. He is giving them what we could consider as his final recommendations: what is normally said in the last moment, in the last farewell; that which has an especial force, as if it would be the last will. We imagine them in the cenacle. Jesus has washed their feet there, has announced them again He must go, has transmitted them his command of fraternal love and has consoled them with the gift of the Eucharistic and the promise of the Holy Spirit (cf. Jn 14). And, well ahead this 15th chapter of John's Gospel we now find the exhortation to unity within charity. Our Lord does not hide to his disciples all the dangers and difficulties they will have to face in the near future: "If they persecuted Me they will persecute you..." (Jn 15:20). But they should not be intimidated nor overwhelmed by all the hate they will find in this world: Jesus renews his promise of the arrival of the Protector, while assuring them they may ask and they will be given. Finally, the Lord prays for them —for all of us— to the Holy Father during his priestly prayer (cf. Jn 17). But our danger does not come from outside, though: the worst menace may arise within ourselves when we fail to respect the fraternal love among the members of Christ's Mystic Body or the unity with the Head of that Body. The recommendation is clear: "I am the vine and you are the branches. As long as you remain in me and I in you, you bear much fruit; but apart from me you can do nothing" (Jn 15:5). The first generations of Christians managed to keep a very clear conscience of the importance of remaining united through charity. Here is the testimony of one the Fathers of the Church, saint Ignatius of Antioch: "Do you therefore all run together as into one temple of God, as to one altar, as to one Jesus Christ, who came forth from one Father". And here is also an indication from the Virgin Mary, Mother of the Christians: "Whatsoever he said unto you, do [it]" (Jn 2:5).